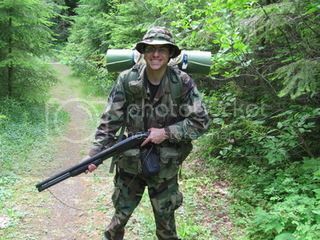 A light setup for bugging out in a bug-outable situation requiring the overt carrying of a rifle. Yes, it is far far more likely for a bug out scenario to occur that would require some discretion and a well concealed pistol (ie natural disaster, fire, storm a-coming, etc) but if needed, I've pieced together this minuteman rig. Its a real light and handy kit. - AR-15 rifle: PSA chrome lined 4150 upper, Spikes tactical lower, Eotech 552, Streamlight TLR-1s, Blackhawk two point. Along with 5 30rd Pmags. 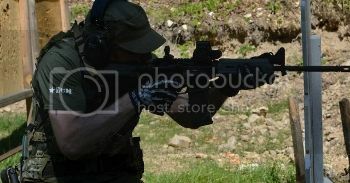 - Level IIa soft armor (issued to me by my agency but not worn in picture). - G23 with a 13 rounder in the gun and a 15 round G22 mag as backup. In a SERPA. - Ka Bar large TDI fixed blade, but I assume this would be used far more for chores than for actual hand to hand fighting. In fact, I hope to never have to use any of these weapons in anger, but especially that knife. Knife v. knife = I get cut more than likely. - Surefire G2-OD with Malkoff M60LF dropin. - Tactical Tailor MAV two piece with 5.11 pouches. - old tiger stripe boonie hat. a well worn, durable hat. - Mechanix gloves. A cheaper alternative to tactical whiz-bang gloves. - Camelbak backpack without the water bladder and loaded with a few essential items. I like nalgenes instead for hydration. - 5.11 6" boots. Pretty comfy and broken in. - Slightly mean face (Issued). - tactical attack kitty guarding my six. JeffLrrp wrote: - tactical attack kitty guarding my six. Favorite Zombie Movies: Shaun of the Dead, Dawn of the Dead (remake), Land of the Dead, 28 Days Later, and Zombieland! 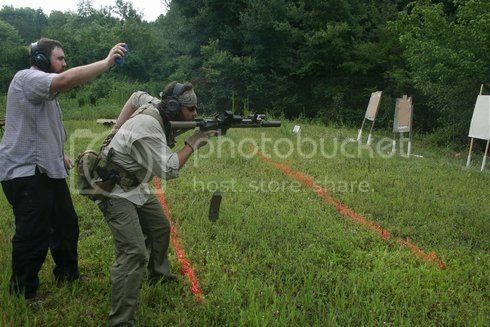 These were taken during one of my buddies' shooting weekends. 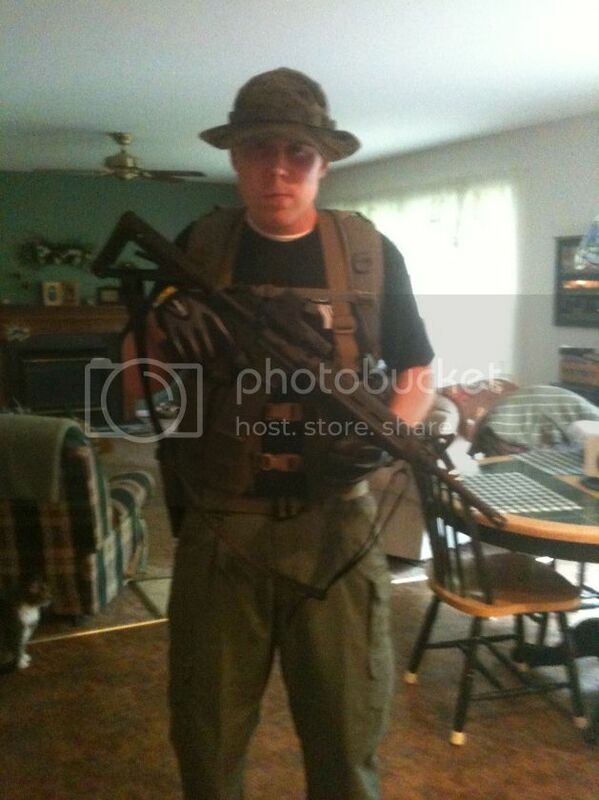 The vest is a Condor "El Cheapo" MOLLE LBV with a triple M4 shingle loaded with 30 round Troy Battle Mags. Mounted on top of the shingle is a Taurus Judge Ultralite in a SERPA crossdraw with a MOLLE mounting plate. On the right is a custom built IFAK/blowout kit. There is also a 20 round shotgun pouch and a dual pistol mag pouch. A 100oz Camelback is on the rear. 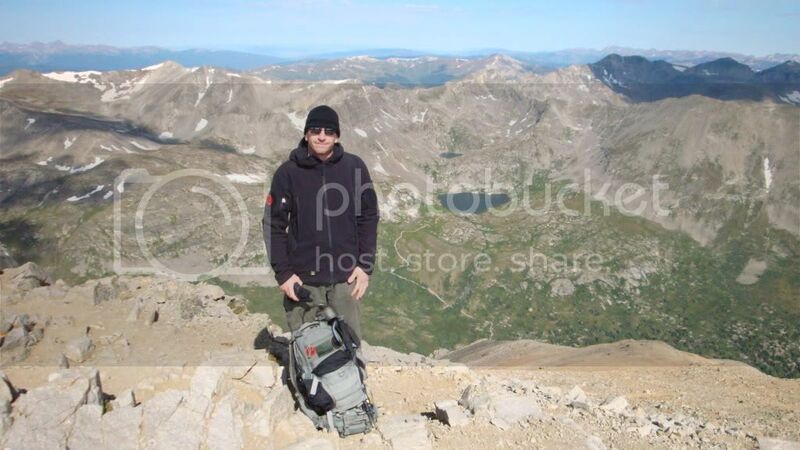 The pants are Wrangler cargos with a Blackhawk Bailout Belt, and the boots (not visible) are 5.11. 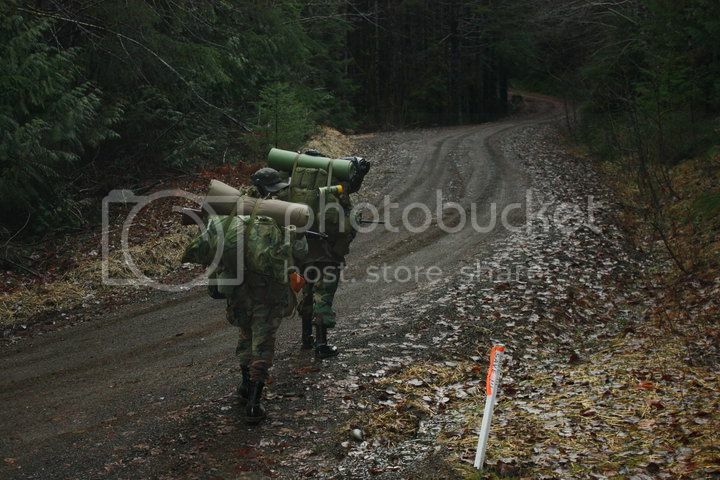 This is my Bugout Bag in action during our third annual Bugout Weekend. 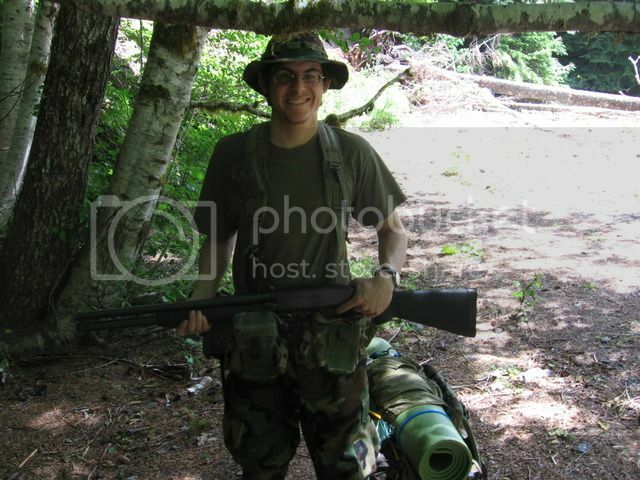 The bag is a USGI MOLLE Rifleman pack, carrying a full 72 hour kit. 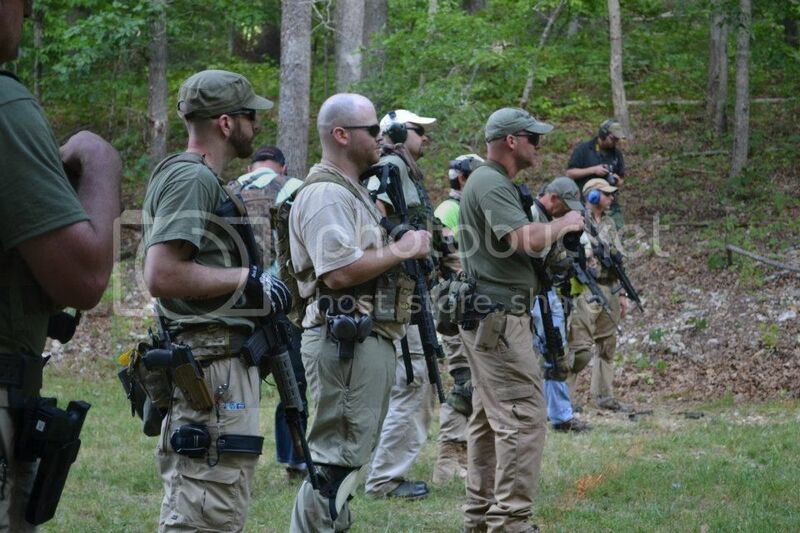 The sidearm is a Glock 22 mounted in a MOLLE woodland flap holster on the pack's belt. Also pictured is a Gerber Gator machete, and a walking stick. 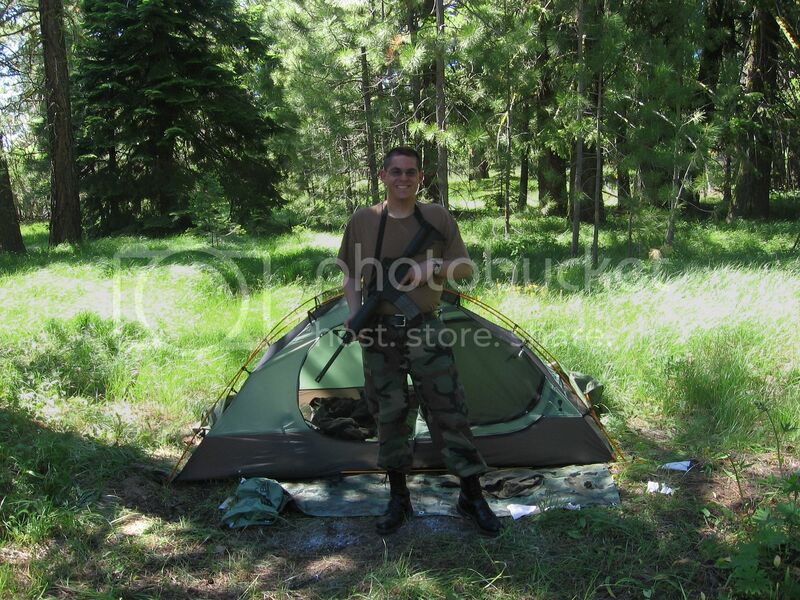 I'm wearing 5.11 taclite pants, quick dry polo, and a 5.11 tactical fleece. 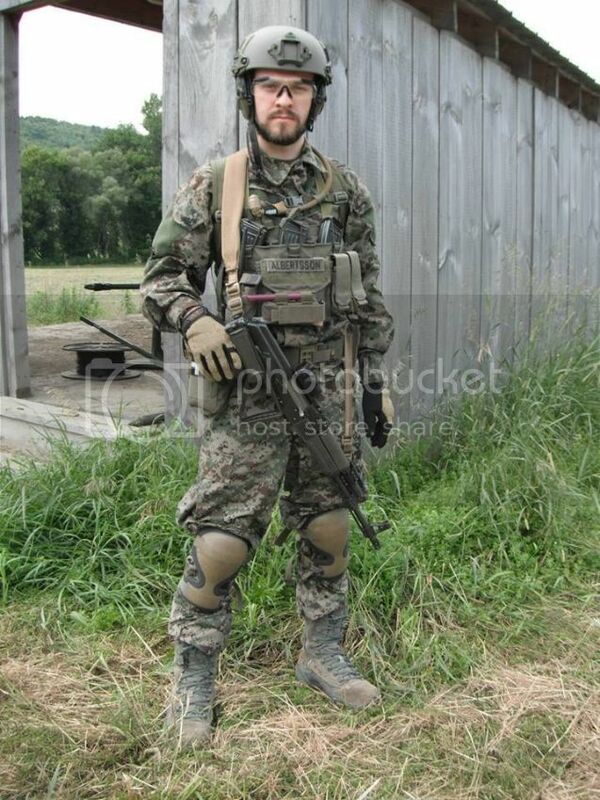 And lastly, a quick work picture to prove I'm not a Mall Ninja! 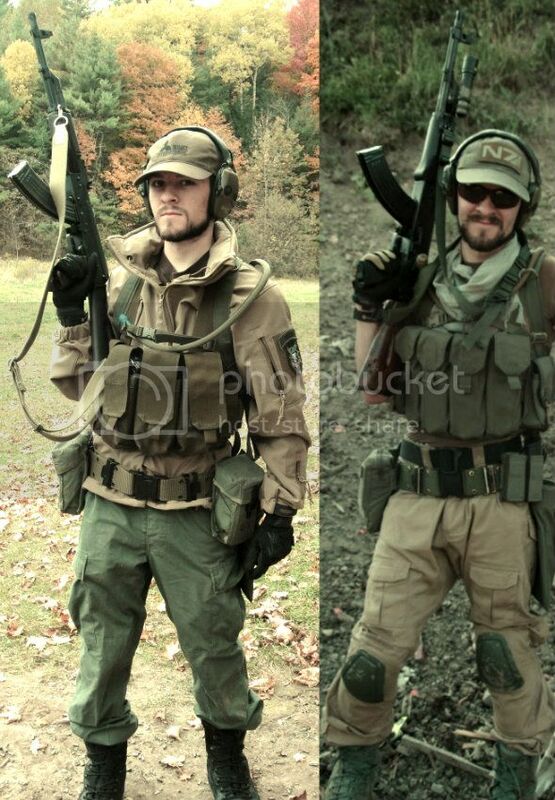 AKFTW wrote: Just threw this together: the evolution of my loadout, 2010 on left and 2012 on right. hey who's that coyote(?) jacket made by in the left 2010 picture? Ack! Trigger discipline, live by it so that someone else doesn't die because of it! Or, to put it a different way, keep your booger-picker off the bang switch unless you're actively shooting!! What in the sphincter of Hell is it doing in there?! Not here. It's a show and tell thread. PM your high-speed advice if you feel it's necessary. Numbers, I dig your rig. Rock on. Didn't realize that qualified as high-speed advice... I apologize for all the delicate sensibilities that I bruised; I was just merely trying to pass on a little education. That is what we do at ZS, isn't it? Anyway, so I don't upset anyone else, here's a picture of me shooting Justin Bieber as a peace offering. Good advice, and I'm sure you didn't hurt Omega's feelings. This just isn't the place for it. Pic thread, that's what PM's for. THE LATEST AND GREATEST IN TACTICAL GEAR WON'T SAVE YOUR LIFE...... BUT, HEY, WHAT'S WRONG WITH SURVIVING IN STYLE? I was just thinking as I clicked on this, there's a lot of posts here from guys who aren't mall ninjas at all! I just want to thank all the brave posters on this thread. After spending a very amused evening lurking on this thread I decided to come back to Zombie Squad after a hiatus. Thanks to crypto for his courageous.... over sharing. Or is it our braveness for looking? Props to TerryGecko for his concerted representation of the urban demo. And honorable mention to Carl M Neit for best use of animal support. Thanks guys. Laughed too many times to explain to my wife. 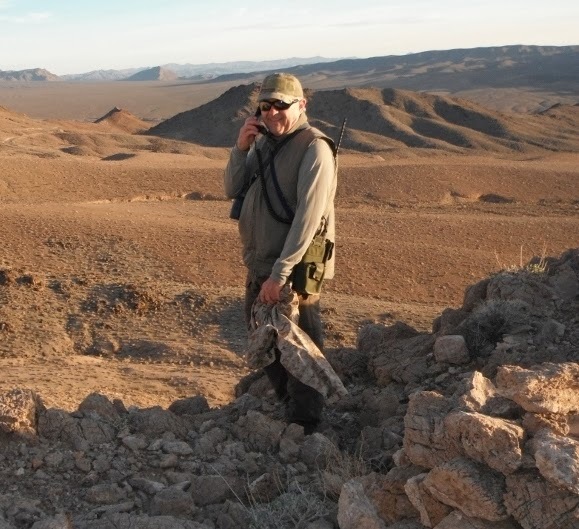 From my most recent trip in the East Mojave that I added to my blog. I am using an older but very nice PRC-68B (30 - 90 MHz) to keep in touch with our base camp on the other side of a nearby hill. 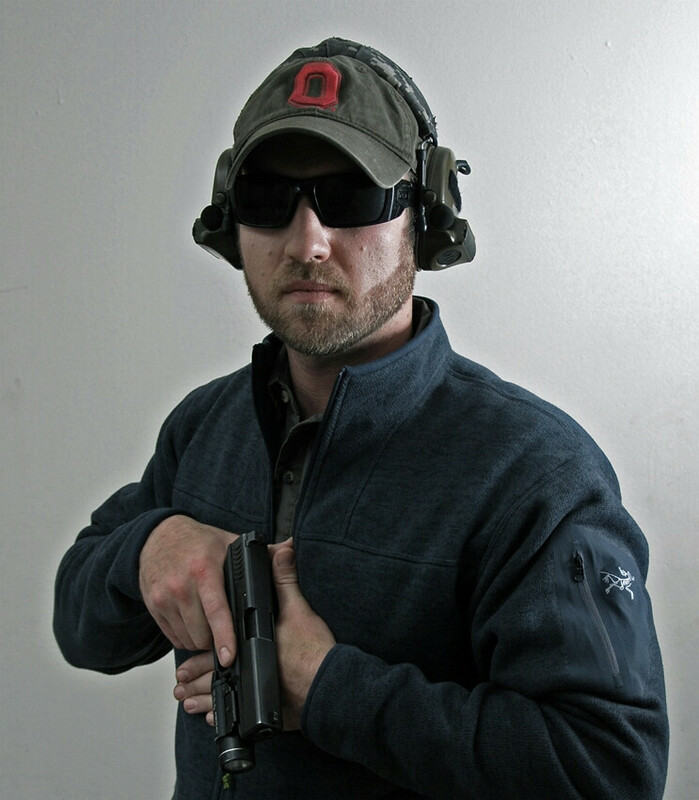 I was also trying out a new sage green Primaloft vest from the military's "Happy Suit" ensemble. And just because, a herd of mall ninjers and one of the few pics of me that year not actually shooting a barricade! 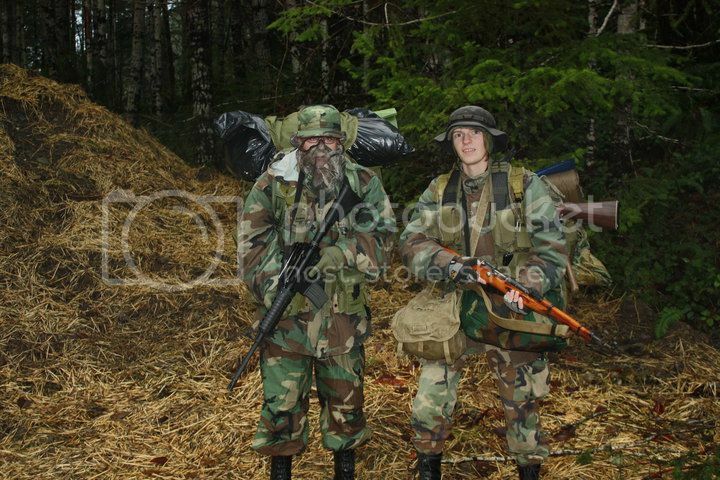 Notice the tactical chewing gum in my pocket.